At Metrofone we specifically choose to partner exclusively with EE for our mobile customers because we want to ensure we are always offering the best in connectivity to our customers and we know that EE has terrific UK coverage and super fast 4G. We also are now able to provide home broadband and calls from the lovely people at EE which completes the excellent package. Our EE broadband packages are pretty amazing, and we are delighted to be able to offer them to our customers, existing and new as we are entirely confident that EE Broadband is the best on offer. 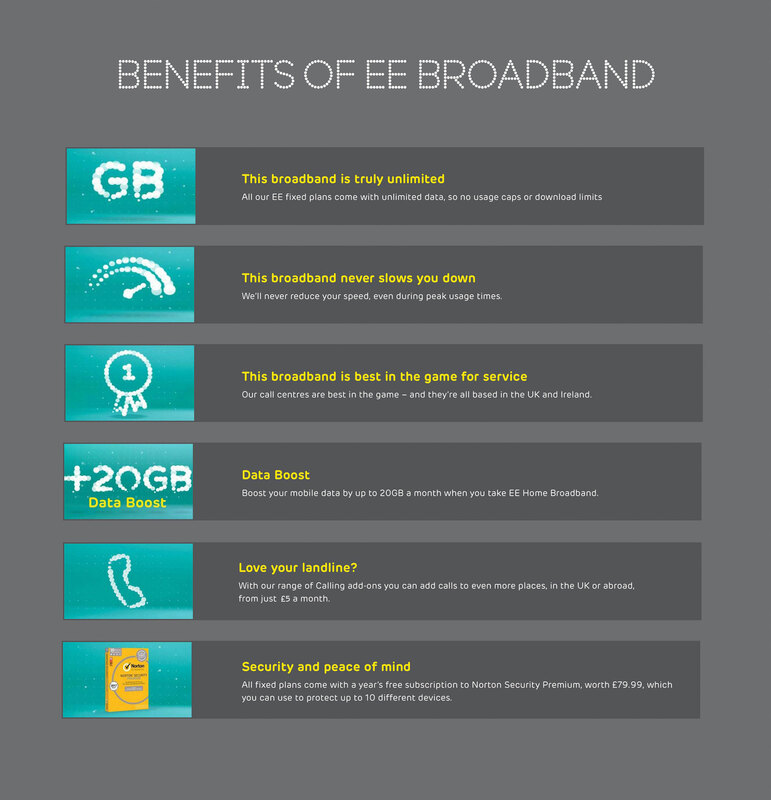 Not only can customers get a reliable and fast broadband service, and if they wish home phone connection, EE also offers a range of extras to their customers. Data boost is perfect for those customers that also have an EE mobile phone contract, or if you are considering a new contract the perfect carrot. With Data Boost you can enjoy a day package of either 5GB or 20GB on your mobile phone as a thank you for taking out a broadband package provided you have an eligible EE pay monthly mobile phone plan. The 5GB data boost is on offer to those customers who choose fibre and standard broadband from EE, and the 20GB data boost is on offer to those customers who choose fibre max broadband from EE. Details of how to get these great benefits are available on request. Not only that but EE Broadband customers also have access to a free subscription to Norton Security which is worth £70 and brings you the free benefits for up to 10 of your devices so the whole family can be protected and secure when using the internet. EE also are also proud that their broadband is totally unlimited. Choosing not to impose any usage caps on any of their plans, so no matter what plan you prefer you can be online for as long as you need with no hidden charges. If that is not enough the price you pay when you take out the contract is the price you will be charged for the whole length of the contract. Many packages offer a lower rate for six months and then you experience an unwanted price hike which EE do not do. Instead, they guarantee the price you are quoted when you take out your broadband deal is the price you pay. Finally, EE has a fantastic customer service team waiting to help you should you experience any issues, whether you are in the UK or Ireland their fantastic staff are just a phone call or web chat away. When you subscribe to an EE Broadband package, you will receive the latest hub, and the Smart Hub is an excellent piece of kit that will ensure that you have the best connectivity at all times. It has been specifically designed to support multiple devices as EE understands that homes can be busy with laptops, mobiles, tablets and more all looking to connect at the same time. It has access controls for the account holder meaning that you can remove access for kids overnight, or schedule the hub light to go on or off. The Smart Hub features save Wifi antennas which means that there is a stronger and more reliable Wi-Fi signal all over the home, it also has a more powerful chipset, faster process and more memory than the previous hubs which gives super smooth video streaming on more than one device at a time, meaning there is no fighting over who can watch what, when. Everyone in the home will experience an outstanding performance no matter what others are doing. EE Broadband was already really impressive but always striving to ensure their customers have the best on offer, EE has introduced G.Fast offering maximum speeds of 330Mb/s and a managed installation with customer focus at the core. G.Fast is the perfect solution if you have a busy household with more than one user. Homes that love to game and stream movies, that spend a lot of time online are going to really love this new improved broadband package as it supports multi-user devices with everyone receiving an impressive performance and no waiting on refresh and loading screens. This means 4K streaming, music, uploads, HD downloads and gaming are all deals with effortlessly. Because G.Fast requires both the EE Smart Hub and an Openreach modem the service has been rolled out as managed installation and an engineer will come and connect the service for you. Being a newer service the roll out across the whole country will not be complete for a couple of years; however, there will be 46 locations immediately available so if you are interested in this service do check the coverage map or speak to a member of our team. 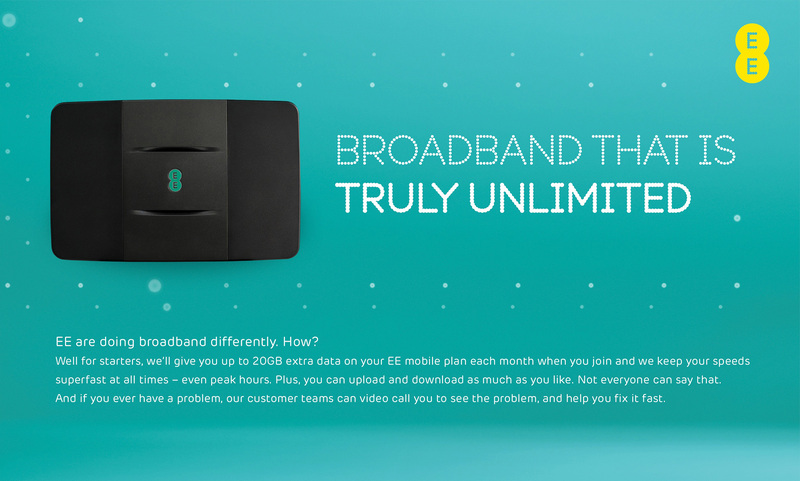 EE broadband already offers great coverage so if you are not yet in a G.Fast area you can still take advantage of the great speeds they offer and there are some amazing broadband deals to be had when you become an EE broadband customer. This new and improved service has seen the evolution of Fibre Max becoming two plans, both offering amazing benefits to the customer. Fibre Max 1 offers the customer average download speeds of 145Mb/s and average uploads speeds of 28Mb/s while Fibre Max 2 offers maximum download speeds of 300Mb/s and maximum upload speeds of 47Mb/s, giving you the best range of choice when it comes to your EE broadband deal. If you are not in an area that offers G.Fast at the moment, or if you are looking for an option that meets a different budget then EE have a wide range of packages on offer. Standard offers average speeds of 10Mb/s; Fibre offers average speeds of 36Mb/s and an average upload speed of 9Mb/s. Fibre Plus offers average speeds of 67Mb/s and an average upload speed of 18Mb/s. The packages offer a single set up fee which means that you can easily see the full cost from the start and there are no hidden charges. The broadband setup fee is just £10, fibre £15 and Fibre Max free. If you wish to add your home phone to your EE broadband package, this has also been made really easy, with a clear calling add-on tariff that meets your needs. Any of the home phone plans can be added to any of the broadband options making this a really flexible way to approach the issue. If you are looking for any time calls to UK landlines, you will be charged an add-on fee of £5 a month on top of your chosen broadband deal. If you are looking for any time calls to UK landlines and mobiles (1500 minutes to UK mobiles allowance) then you will find a charge of £8 a month added on, and finally if you have an international calling requirement then you can have included UK landline calls, 1500 minutes to UK mobiles allowance and inclusive calls in 50 countries with 30% of calls to landline in other countries for £12 per month making this a really flexible calling plan. EE also offers some really great benefits to customers that choose call plus add-on which costs just £5 a month and brings some really great benefits including Anonymous Call Rejection which blocks calls from anyone withholding their number, Three-Way Calling which is perfect for families and friends split over many localities, Call Diversion which means you can divert your number to another phone even when the phone is in use. If that wasn’t enough, you also get Choose to Refuse which allows you to block up to 10 numbers that might be causing an issue. Ring Back gives you the freedom to dial a number once, discover it is engaged and press 5, this will ring you back when the number is free to take your call. Call waiting is a great feature that alerts you to the fact that another call is waiting and gives you the freedom to take it or remain with the original caller. A reminder call is the final benefit to this package which allows you to set up a reminder or schedule a regular alert for the same time every day to remind you to do something.